Join in as a big pillow fight breaks out on Luftansa Flight 687, en route from Tel-Aviv to Frankfurt. Nice to know there's still some fun left in the anxious skies. For any dedicated Infrastructuralist -- a subculture that includes **cough cough** us! 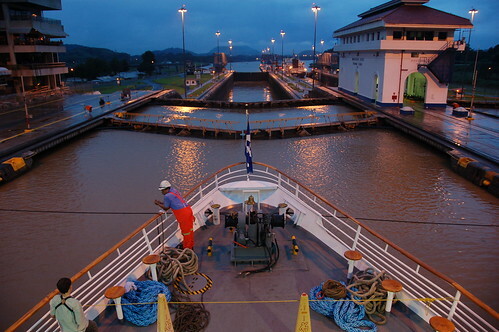 -- the Panama Canal is a must-see attraction. An artery of commerce that quite literally reshaped the world after it opened in 1914, the Panama Canal is a stunning monument to mankind's desire to get from here to there as efficiently as possible. Unfortunately, the canal is also difficult to experience first hand. The problem is that it is a) in Panama and; b) accessible only by ship. Here's an alternative: This nicely edited video spans the entire Panama Canal in just 1:56, and as an added bonus it even comes with a trance-inducing soundtrack.